“Could you engrave the names of all seven family members on the back of the tabletop?” This inquiry well expresses the character of IPPONGI, one of our table collections. People who order this collection seem to want something more for furniture than what mass-produced products can offer. IPPONGI is a wooden table made with trees that have lived for over a hundred years; made for people who can enjoy the figures and knots of the trees as their unique characters. Sometimes, customers come to our factory to handpick their own special pieces out of the pile of wood materials in the drying process. Every piece of wood has its own expression: cracks, holes, etc. made under severe natural circumstances, and those special pieces chosen by customers are then created into the one and only pieces of furniture in the world. Before starting to process wood, our craftspeople carefully study it, taking a look in all directions; touching the surface, etc. 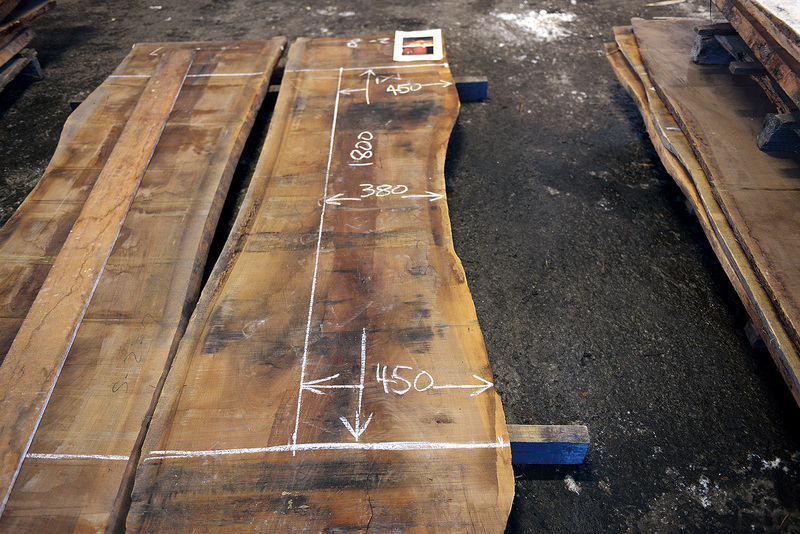 This is the important process of getting to know wood correctly, as they say. Furniture using this kind of wood (with strong natural characters) tends to be rustic and bulky, but they devise ways to create a delicate design while accentuating the definitions of such wood. 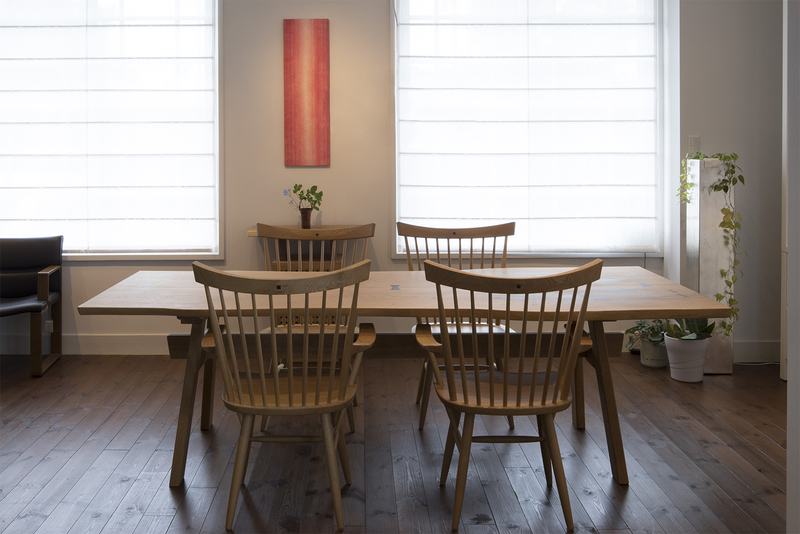 Recently, it becomes difficult to procure wood in low grade which no one wanted to use for furniture a few years ago. 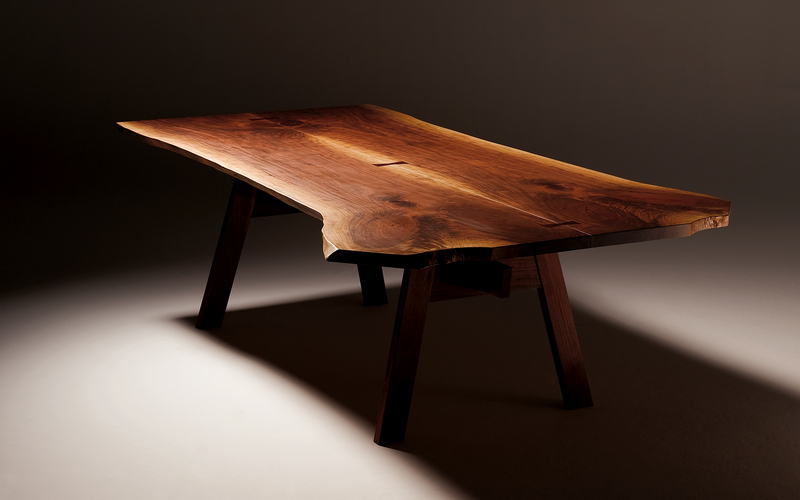 More and more people have become aware that wood with strong natural characters can be made into beautiful pieces of furniture. We don’t think it’s an obstruction for us, but are pleased to know that the new value of wood created by our IPPONGI collection has started to grow. It is a sound community where people use wood thoroughly having respect for wood materials as one of the blessings from the forest. We are sure that the aforementioned customer will cherish our IPPONGI table for many generations to come, and expect there will be a request to engrave the name of a new additional family member in the future.